The burial ground lies next to the main road entering Lochcarron village from the NE. There are many pre-1855 stones, and many blank undressed stones.Some are in poor condition. The modern burial ground is around the former Parish Church, a few hundred yards away. Picture Added on 28 July 2008. Any idea where the records are for the Old Lochcarron Cemetery, Pre June 1939, as the Lochcarron registrar does not have them. Looking for George Maclennan Buried May 1939. Added by George Maclennan on 13 August 2009. I would expect the Local Office to have them, George. Sounds as if they've disappeared. In any event, such records tend to show who purchased a lair, rather than who was buried. I've a data base of about 80% of legible stones at Old LC, but cannot see a George Maclennan on it. I hope to go back to survey the rest soon, so may yet find him. Added by Roddie on 14 August 2009. I have found John McGregor buried Lochcarron 1847 age 60, on graveyard website. Does he have a headstone, and if so what info is on it, I'm looking for his parents names and want to check his age. Added by Ann Hammond on 06 September 2010. Hello Ann the only headstone I know of is Image No. 8963. Added by Roddie on 06 September 2010. Dear Mr Macpherson, I am looking on behalf of my distant cousin in Dunedin N.Z. who believes his ancestor John Cameron, a shepherd, died at Slumbay in 1839 and may be buried at Lochcarron.Two of John's sons emigrated Alex (to USA) and George (to NZ). My cousin could probably amplify this information if it would be of interest to you. If you can find John Cameron's gravestone or an inscription I would be very grateful. Added by Dr Kenneth J.Nichol, on 10 January 2012. I am searching for a Norman McClennan, wife Betsy, who is believed to be buried in the Old Chapel burial ground. He died 10/9/1872. Have you any records regarding this person's burial plot? He was a crofter and lived at Jeantown. Thanking you for such a wonderful site. Added by Julie Reid on 02 December 2012. I am looking for the grave of William Greig who died on 13/02/1880 at Lochcarron and I assume that he was buried at Lochcarron, also his wife Margaret who died 1/02/1879. Any assistance in finding his grave would be appreciated. Thankyou, Alan Greig. Added by Alan Greig on 01 June 2015. I'm looking for the grave of a Murdo(Murdoch) Murchison married to a Kate (Catherine) McLennan, died pre 1874. He was from the Lochcarron. Struggling to find records for him. Added by Jill Boydell on 22 February 2017. 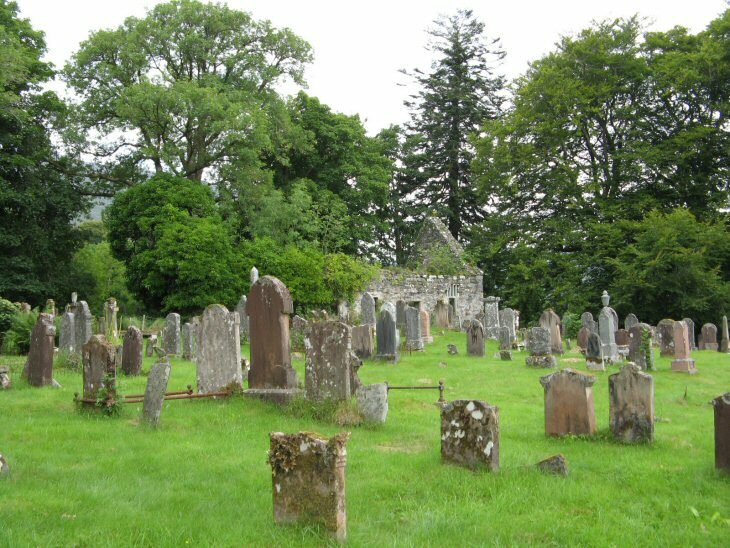 Sir Hugh and Lady Fraser of Stromeferry were buried at Stromeferry, but re-planted at Lochcarron churchyard by his grandson Sir David Wills. Donnie Gordon of Balmacara has a plaque to their memory which remains to be re-attached to a suitable spot there. Added by Ruaraidh Hilleary (nephew of Fraser's grandson) on 13 November 2017.